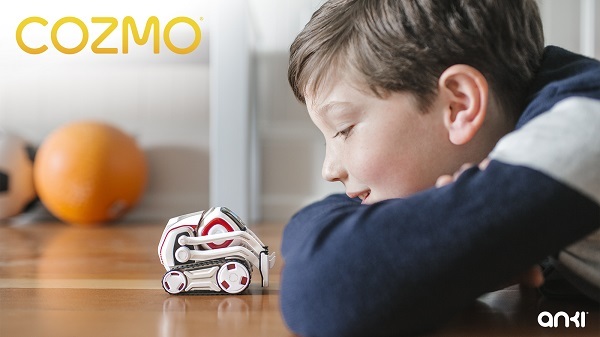 Anki launches Cozmo robot with Artificial Intelligence (AI). Anki, the robotics and artificial intelligence (AI) company, today launches Cozmo: the little robot with a big brain and even bigger personality. Cozmo is one of the most sophisticated robots available today. Cozmo recognizes and remembers you. He interacts with you, plays games, and gets to know you over time. Developed by a multidisciplinary team of PhD roboticists, world-class animators, renowned game developers, and a lead designer of the Batmobile, Cozmo represents a major leap forward in the future of play at the intersection of film, toys, videogames, and robotics. Powered by advanced robotics, AI, and computer vision, Cozmo has a brain that processes more data per second than all the Mars Rovers combined. Coupled with his playful personality, Cozmo is one of the most sophisticated consumer robots available today. Robots with comparable capabilities are found in labs for thousands of dollars and stand several feet tall. More than three-hundred parts make up this robot that fits in the palm of your hand. Cozmo's heart and soul rests within his emotion engine, which evolves as you develop a bond. He's brought to life with complex facial expressions, a host of emotions, and his own voice and language. His dynamic soundtrack matches his mood and corresponds with the games and activities, elevating playtime to a uniquely cinematic experience. Cozmo is constantly scanning his environment and recognizes people while reacting to emotions. His eyes light up when he sees a familiar face. If you haven't played with him in a while, he'll nudge you to play one of a handful of games. If you beat him, he might sulk. While Cozmo may be a supercomputer on treads, playing with him isn't super complicated - all you need is a compatible iOS or Android device. There are no parts to put together so you can get going right out of the box. Starting today, you can pre-order Cozmo from Anki.com. He ships in October in the U.S., and will be available for $179.99.